Apple at Mobile World Congress, makes its appearance for the first time ever. It has been listed as an exhibitor there. The event will be held in February, next year. Apple is ready to appear on the ‘trade’ scene, again. The tech giant was last seen in a trade show at Macworld, in 2009. After that, it just disappeared from the exhibition scene, altogether. Now, after a long gap of almost 7 years, it is re-entering this arena. This time, we’ll get to see Apple at Mobile World Congress (MWC), which will be held in 2017 in Barcelona. It will be Apple’s very first appearance at MWC. Here’s the complete story! The Mobile World Congress is one of the biggest exhibitions in the telecom industry. It will be held next year, from February 27 to March 2. Apple has got itself listed as an exhibitor at the event. The company has already made its bookings for the same. It has reserved its place in Hall 8.1 for the App Planet. It has also reserved two more slots above Hall 2, which lies in the Fira Gran. Apple at Mobile World Congress is planning to participate in the App Store and Planet of the Apps, promotions. Since, it has booked its place in the App Planet, this strategy seems quite inevitable. The App Planet at MWC, has been referred as, “a unique area focusing on the latest technology from the fast-moving apps industry”. So, it seems to be the perfect place for Apple to showcase its App Store, in public. 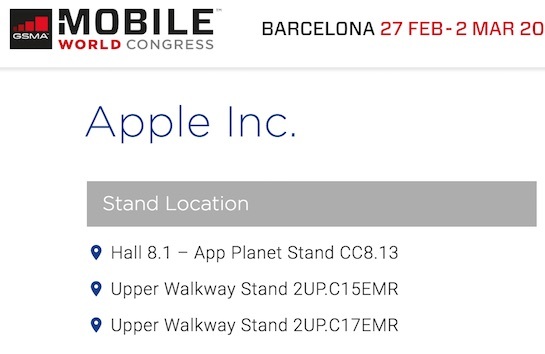 The other two spaces booked by Apple at Mobile World Congress, are meeting rooms. This entails that Apple will not be showcasing everything at the exhibition. It will be keeping some things away from the public eye too. This doesn’t come as a surprise, though. Apple has already kept new product announcements, limited to its own media events. So, another secrecy from the company doesn’t come as a huge shock. Apple seems to have lost its enthusiasm in participating at trade exhibitions. So, even if it decides to walk away from Mobile World Congress; people shouldn’t be alarmed by that. It would be better if they don’t keep their hopes too high. Let’s see whether we’ll get to witness Apple at Mobile World Congress, or will it flee the scene again!